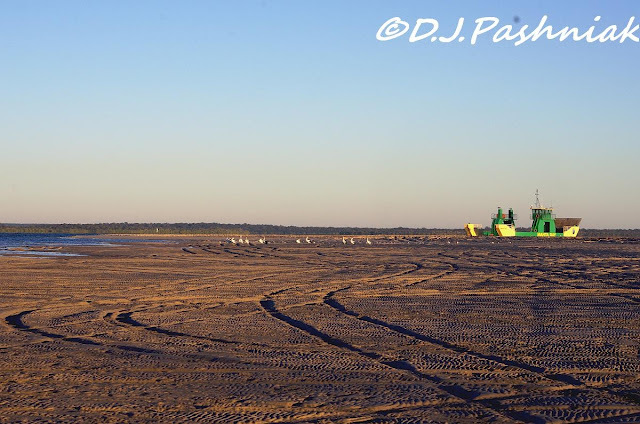 I went out to Inskip Point early the other morning to see if there were any migratory shorebirds back from the northern hemisphere. The Eastern Curlews, which are the first to return, should be returning from now on but I did not see any shorebirds at all on the Point. There were a few out on the sand island in the middle of the Strait but there did not appear to be any more than the ones that have over-wintered. When I arrived the sun was still low on the horizon, the shadows were long, and the light was golden. The only birds on the Point were some Terns and a group of Pelicans. Soon after this the first vehicle drove out and the Terns flew off, but the Pelicans moved out of the way and then decided to stay at the edge of the water. On the way back to where I had parked the car there were lots of birds calling from the tops of the trees and deep inside the bushes. This White-cheeked Honeyeater stayed for long enough to let me get a quick photo - even if it was against the light! 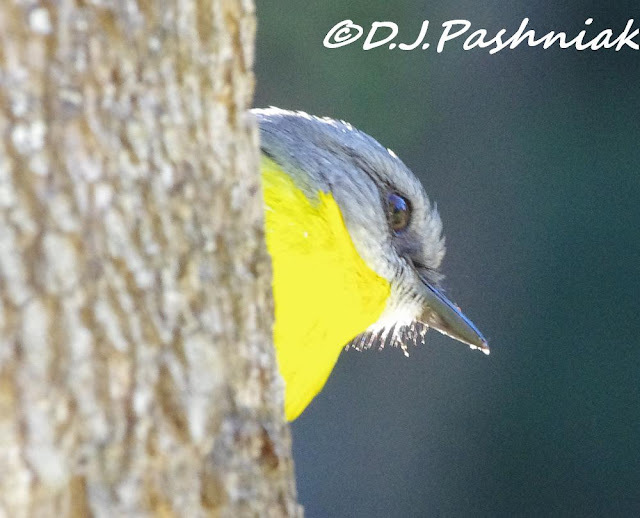 I was trying to see what birds were fluttering back behind some bushes when this Eastern Yellow Robin put its head around a tree trunk - then flew off before I was quite ready! I hope you are not tired of seeing photos of Red-backed Fairy-Wrens! I go for months without seeing any of these birds - so I am certainly not going to stop taking photos of them when they are so visible right now. The little male bird was hopping around down in the plants on the ground and then fluttered up to this dead bush where the female was waiting for him. The shadows were so deep around the bush that it was hard to see anything - except the white front to the birds. 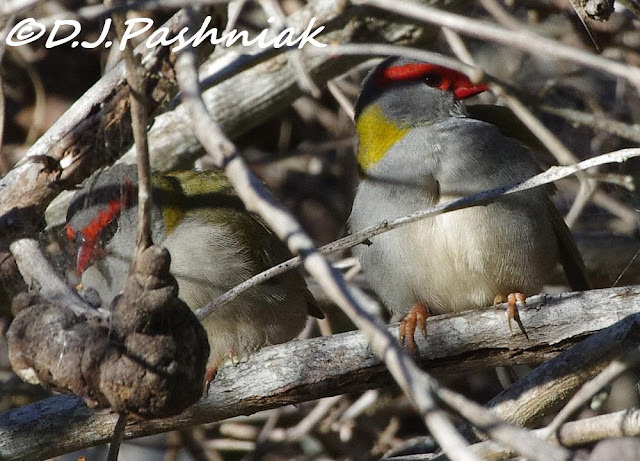 I saw these ones and initially thought it was another female Fairy-Wren - but when I looked closer at the photo I saw these Red-browed Finches. It is not a clear photo but better than nothing! What great birds Boom & Gary of the Vermilon River, Canada. I love the scenic shots of the coast and boats. And the birds are awesome, Mick! I could never be tired of seeing the cute Fairy Wrens. All the birds are pretty, including the pelicans. Great post and wonderful photos. Great photos especially the one of the robin. Wonderful birds and such a variety, Mick! Your captures are superb! Such a terrific post for the day!! Lots of activity Mick! Terrific captures! Pelicans are one of my favourite birds, and the Fairy Wren is the sweetest birds I have seen! A beautiful colour as well! These are just great Mick. I love the picture of the two little birds "nuzzling" each other. I wonder about the pelicans and food and why there are so many this year...those things are so puzzling. In the top picture, the green boat looks like it is motoring through grass. Brilliant photos! 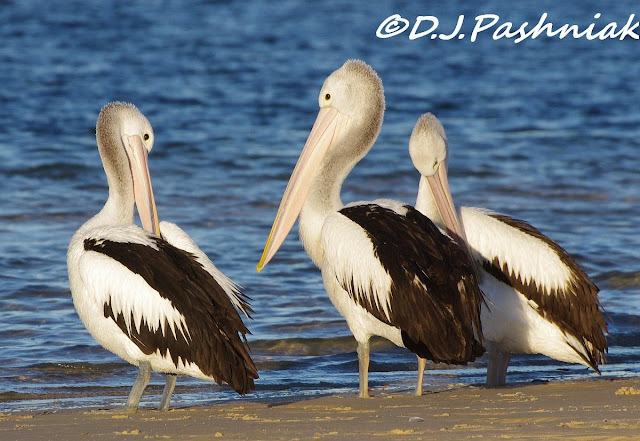 I do love the shot of the pelicans, but your others show some very cool birds. Beautiful captures from your corner of the world Mick ... and no! 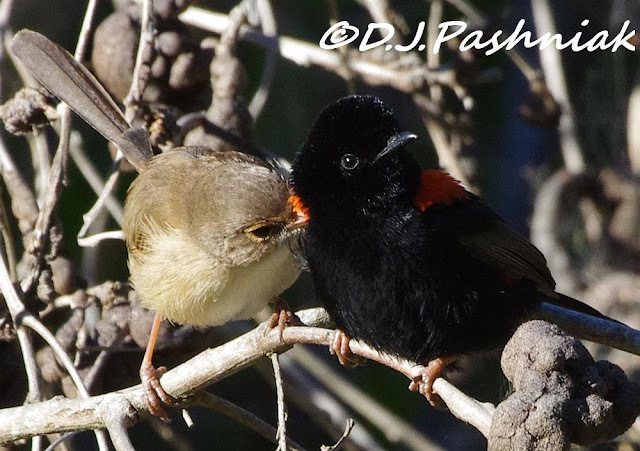 I never tire of seeing photos of delightful robins and fairy wrens. pelicans are such characters, and the wrens are sweet. I love going for beach walks - I haven't in a while - and should - so thank you for taking us along. Have a great week and thank you for stopping by my blog today. I hope you get to try quinces again soon. AH! So some shorebirds are returning to your area. Here in Canada a few of the shorebirds have begun their trek south. Seems like it's too soon, but I know it's always this way. The seasons come and go so fast! Mick, What struck me about this post and other is the vast areas you survey and how the birds are able to move not too far away but perhaps be out of sight to you? You have some interesting thoughts about the pelicans too - do the shallower waters make for easier fishing or lack of fish? Sorry to be a nuisance with my questions. Love your small but colourful bird pictures, the Fairy Wrens are just brill. Hi Phil, I think maybe next week I need to do a post about the numbers of birds these waters can support. For a quick answer - 3 years of rains in the outback have bred up huge numbers of waterbirds and now it has dried up so the birds are coming here to the coast. Having these numbers here is definitely changing the equilibrium of the bay - but I don't think anyone knows what will happen now and how long it will take. It's going to be interesting to watch and document some of the expected changes. My own observations and listening to local fishermen makes me think that fish stocks right here are never large! 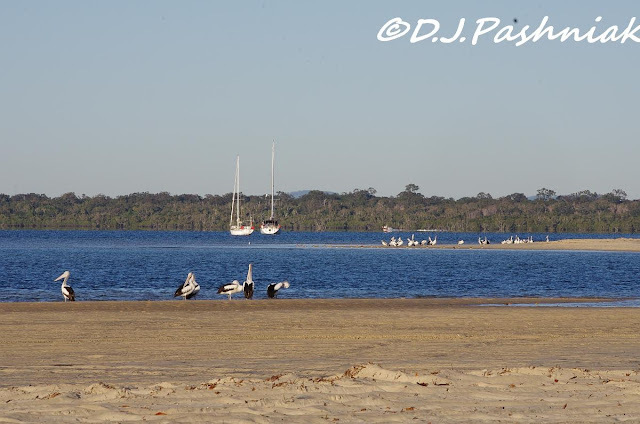 Some months ago I watched a large line of pelicans swimming across the bay and snatching up whatever moved ahead of them. There wouldn't have been much get passed them! Gorgeous shots, Mick! The Fairy Wrens are fantastic! Neautiful birds! 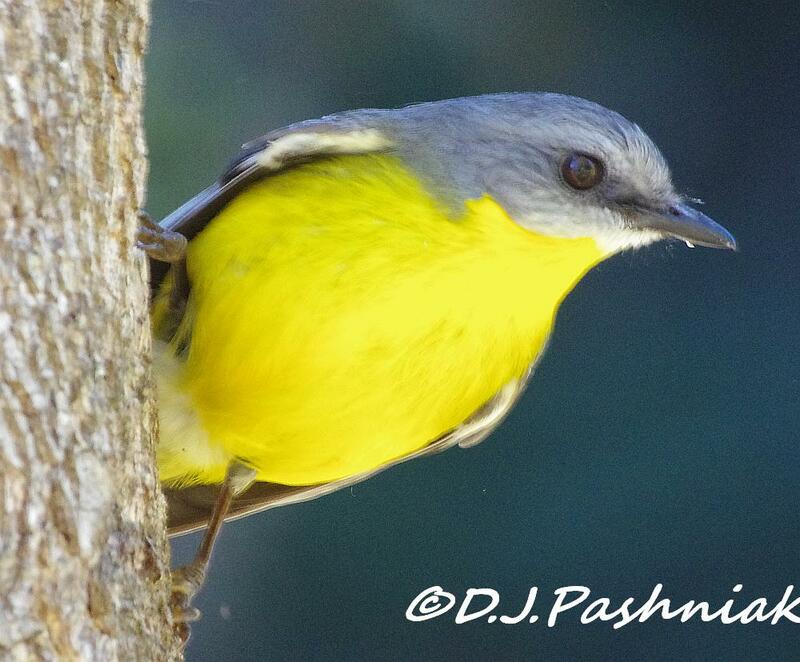 I love the yellow robin. I think all of your birds are incredible! We don't have any of them up here in the cold north of Europe! These are wonderful! I am especially fond of Pelicans! Beautiful birds. I like that yellow robin. 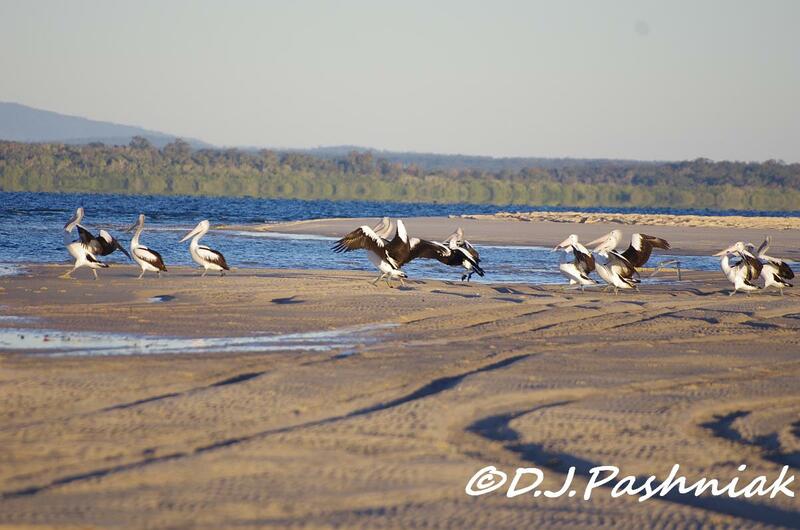 Beautiful pictures of the pelicans. The other birds you have very well photographed, compliments. Keep posting the Fairy Wrens - it reminds why I need to travel! I was pleased to see the budgies - but I still want to see one of the big flocks! Sorry for the pelican's plight they are such noble birds, but from their size look like they'd eat a lot of fish? Appreciate getting to see them close up. I can see why you can't resist the fairy-wrens. They're very endearing with their baby-like round heads. And your yellow breasted robin is entirely new to me--what a treat to know about them. I love your photos. They're so vivid Many thanks. Wow Mick what a great collection. 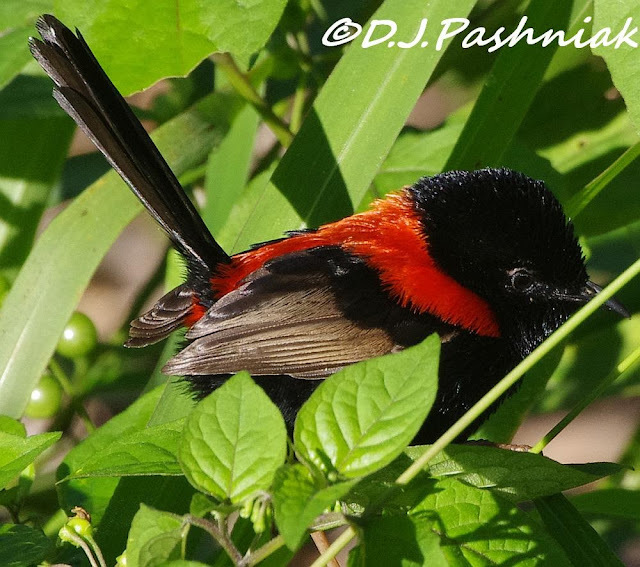 The red-backed fairy wren is a new one for me and I would dearly love to see one in person. 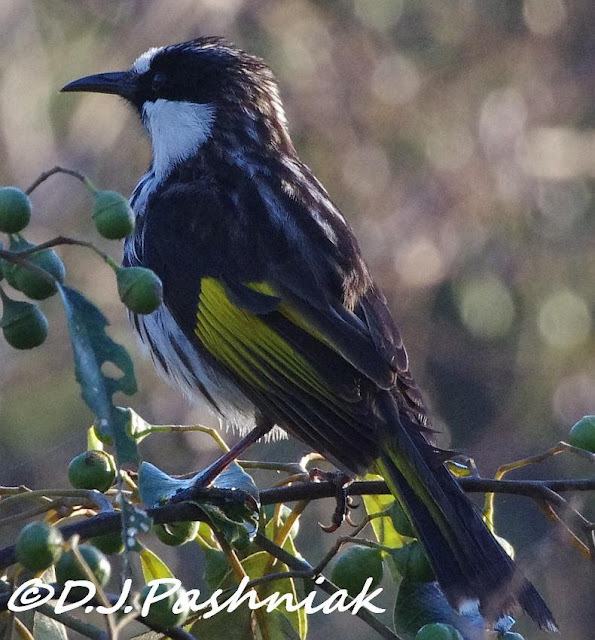 We only have the New Holland Honeyeaters here so the White cheeked one was good to see too and the Red-browed Finches were a great catch too and also one that I had not seen before. Thanks for capturing them. So much color in you local birds! 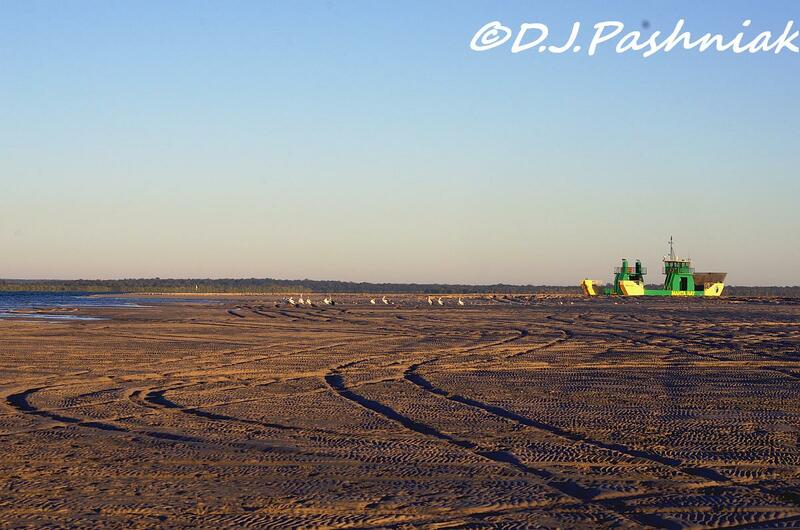 Driving on that tidal flat must be a bit dangerous. All are beautiful and yet I really enjoyed the Pelicans for this entry very much! Oh my, that yellow robin...I want to have one of those...and your Pelicans, so beautiful...thanks so much for your comments. And I love the wrens too... cheers. What a wonderful series of images, Mick!! I do love visiting your blog. I've been very slack with blogging since we returned home from up your way but after having knee surgery on Wednesday, I hope to be a little more active on here while I recuperate. It was wonderful meeting you. Great post, Mick, and superb photographs! It will be interesting to see what happens over time with the pressure of so many additional birds due to the inland drought. Birds are quite resourceful, unless we start interfering too much.